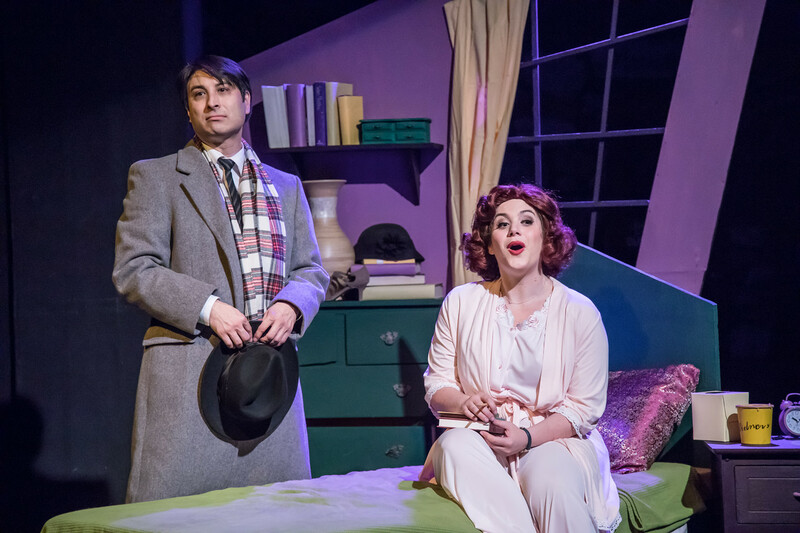 Stylish With A Quiet Dignity: The Morgan-Wixson Theatre’s “She Loves Me” Is A Show Definitely Worth Trying On In Santa Monica CA. 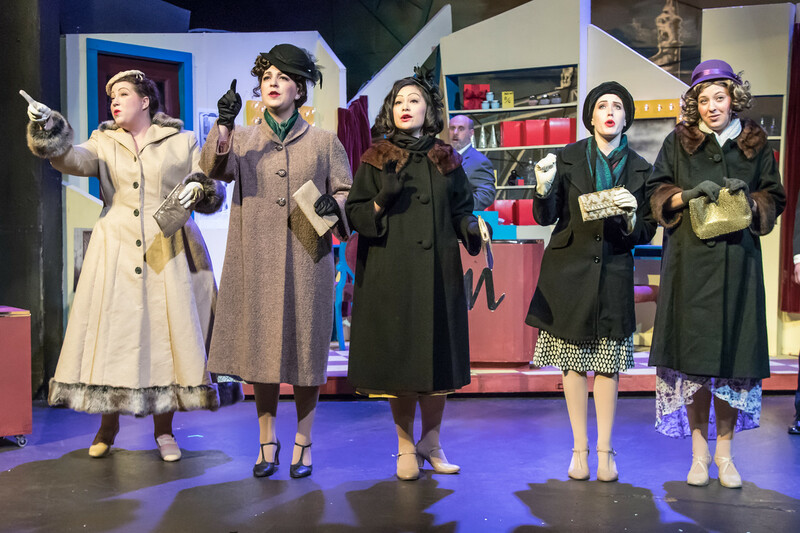 Branda Lock’s Direction plays toward the many laughs the script gives rise to—often by means of the downright clever way more than a few of the numbers are staged. 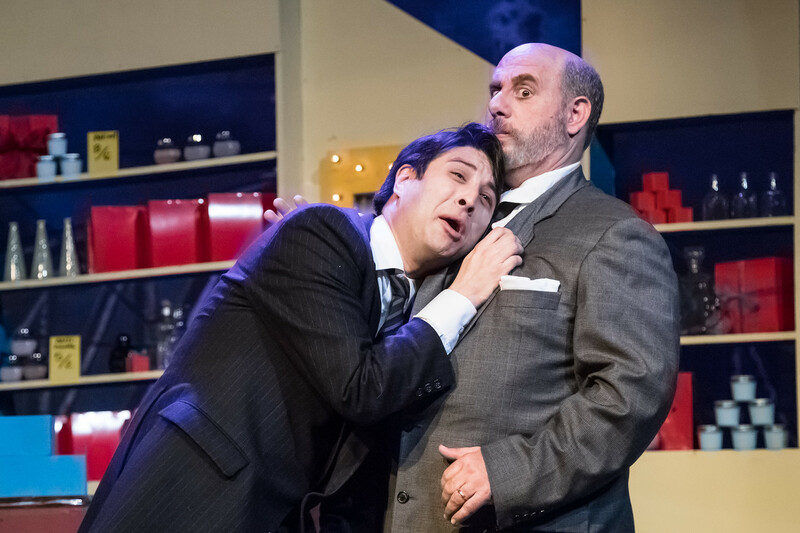 By the same token, many of the most discerning “laughs” or ‘make you think” moments are left understated, which ironically gives them even greater impact; “It’s Incandescent!” (–and like some adolescent) YOU’LL want to scrawl on every wall you see: You’ll LOVE “She Loves Me”! Dear Friend: I had to tell you! (I couldn’t stand it until you knew!) 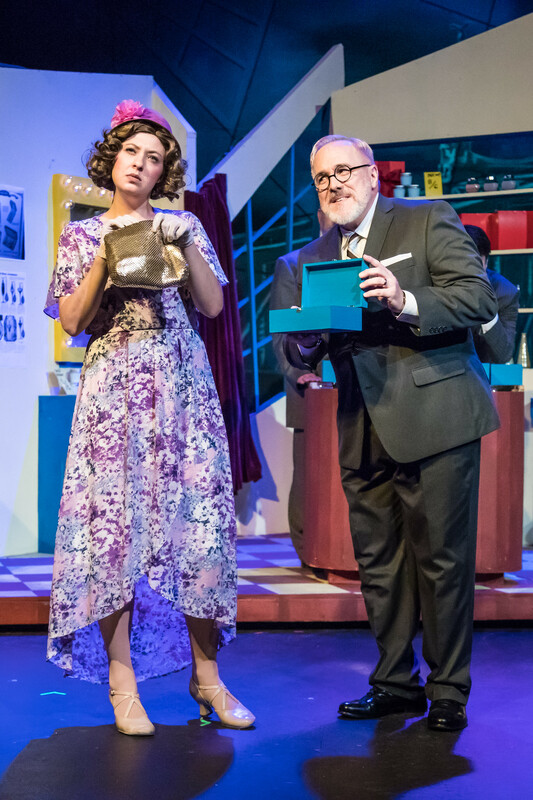 There’s a terrific new production of the classic romantic musical comedy (with a twist,) “She Loves Me”–now playing at “The Morgan-Wixson Theatre” in Santa Monica, California. 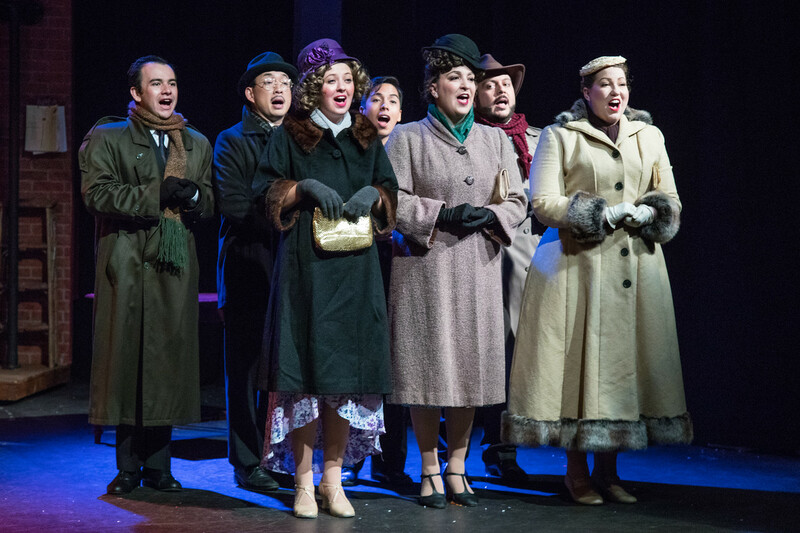 With Direction by Branda Lock, Choreography by Michael Marchak, and Musical Direction by Daniel Koh (who also appears in the cast) there’s no better choice for their 72nd Season Opener (–and that alone is quite a remarkable record for any theater!) This 1963 Tony Award Nominee for “Best Musical” features music by Jerry Bock and lyrics by Sheldon Harnick (–the same team who provided the unforgettable score for the Broadway blockbuster “Fiddler on the Roof”,) while the book, adapted from the play “Parfumerie” by Hungarian playwright Miklos Laszlo, is by Joe Masteroff—himself distinguished for creating the libretto for the equally iconic musical, “Cabaret”. With such a pedigree behind the scenes you know this is going to be something special—and in these days when honest “charm” seems to be in lamentably short supply, this latest production at “The Morgan-Wixson Theatre” hands it over practically by the warehouse-full, living up to all the sublime expectations and routinely even surpassing it! 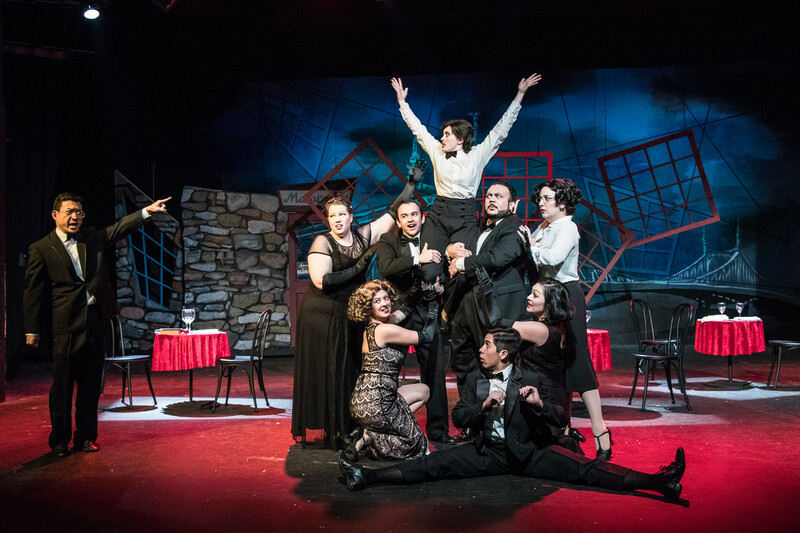 Even so, while such elements or appearances indubitably help authenticate and inform the times, here they never intrude and darken an otherwise very convivial, family-friendly production. (The Producers even give advance warning to any of those easily startled that there will be a gun-shot sound effect shortly before the act break!) Then again, it’s apparent that Lock also has made a concerted effort to expand the input of her extremely talented ensemble, such as with the decidedly melodic trio of female customers who disburse some amazing harmonizing as part of the raucous “Sounds While Selling” early on; while still another noteworthy (and every bit as enjoyable) example of her directorial craft involves the 11th hour group triumph, “Twelve Days To Christmas” which, on top of exhibiting some sensational chorale work from everyone involved, builds gradually into a feverish conclusion, whereas in between each passing (and more and more hilarious) verse, we see quick interactions between Georg and Amalia—each one becoming increasingly more pleasant and amiable, thus demonstrating a progression in their relationship. Each of these steadily build to a definite ‘Feel-Good’ but sincere and genuine conclusion comprised of quick reprises of “Dear Friend” and “Vanilla Ice Cream” wraps things up wonderfully in time for the well-deserved bows. 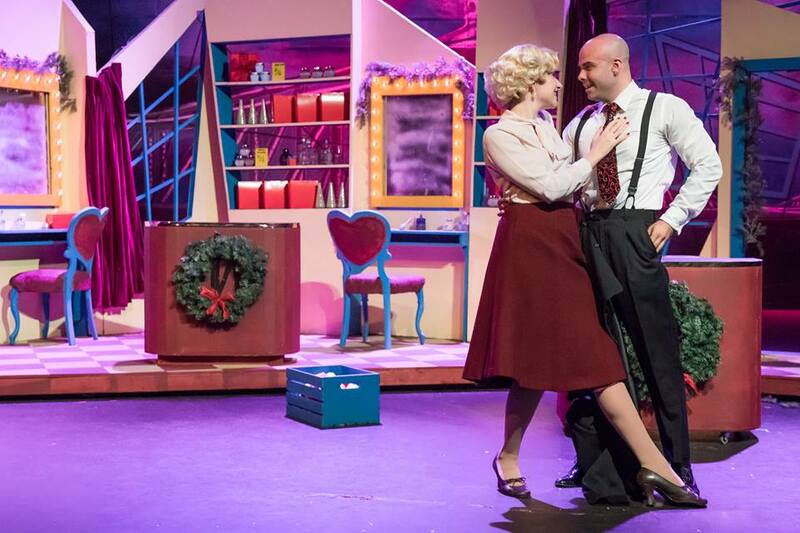 Just as efficacious is the frequently festive choreography conceived by Michael Marchak. 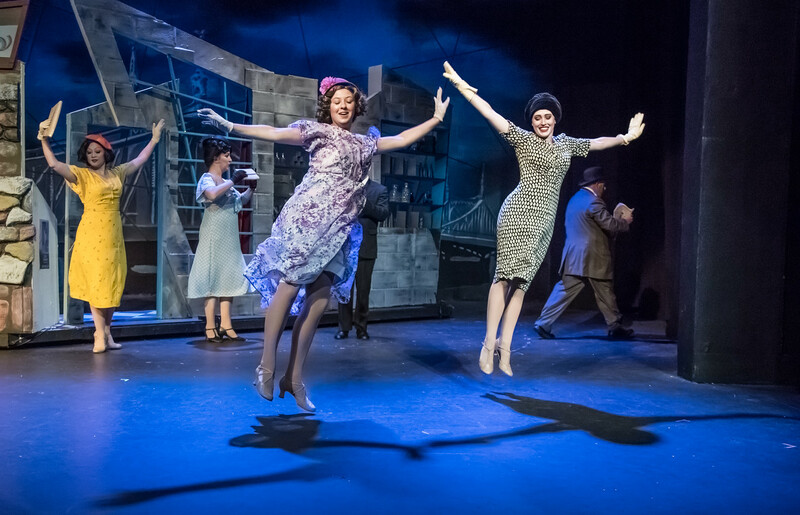 Although admittedly a ‘smaller cast musical’ with fewer occasions for ‘big splashy production numbers’, when they do occur, Marchak’s choreography never fails to deliver the goods—and then some! He’s even handled overture and entr’acte in a savvy, proactive fashion rather than just having us passively listening to music. Instead he gives us an introductory slice of city life as the ‘work day’ begins. More invigorating from a viewers’ standpoint though, is the way he makes use of many different modes of dance—frequently in smaller doses which, in another sample of irony, makes them stand out more. Kicking things off, there’s the blithe little waltz he concocts for Mr. Maraczek’s “Days Gone By” in which he and his staff attempt to ‘teach’ ‘Georg” how to dance. He also interjects a few subtle “Vaudevillian’ style steps into “Ilona’s” Post-entr’acte ‘denouement, “A Trip To The Library”, adroitly giving this smaller ‘character-arc’ tune a much more substantial tone and timbre. The one HUGE group production number arises outside the shop at “The Café Imperiale”, as a coterie of harried waiters and stealthy restaurant patrons—all overseen by a very high-strung Maitre’D, is where Marchak thoroughly lets his imagination and virtuosity soar, starting with a sultry tango before incorporating several transitory sections of traditional Jewish folk dances like the “Hora’ or “Boi Malka” (very symbolic—once again, taking into account the times and place we’re dealing with.) There’s also a brief section featuring “The Charleston” thrown in for good measure (itself further helping underscore the period.) The number then ushers in a lengthier scene between Georg and Amalia as she expects to (at last) meet her “Dear Friend”, but what truly makes it fresh and fascinating is how, throughout their argumentative banter, Marchak repeatedly employs a few snippets of mood-enhancing movement and more evocative-than-provocative dance from those in background. Everyone here exhibits an inherent likeability—even when they’re being ‘disagreeable”! Such is the case with Aric Martin who gives a winning portrayal as “Georg Novack”. Martin categorically has a humongous voice which he displays right from the opening with his part in “Good Morning, Good Day”. As the First Act progresses, he has plenty of opportunities to impress–and impress he surely does with effervescent numbers like “Three Letters” (which shrewdly conveys the passage of time via a trio of missives he’s writing to his special, if anonymous, gal-pal,) and his masterfully manic chanson “Tonight At Eight” (which sees our hero in essence, having a melt-down at even the prospect of actually meeting the lady behind the letters he’s so treasured.) Either way, its mighty, rollicking raving, rapid-fire fun! In Act Two, conferred upon him is what’s arguably his (or any musical leading man’s) grandest hour with the iconic title number “She Loves Me”, when “Georg” finally, gleefully gives vent to his giddy, gratifying, change of heart concerning “Amalia”: “I love her—isn’t that a wonder? I wonder why I didn’t want her? I want her (that’s the thing that matters–and matters are improving daily! )” With him (whether squabbling or simpatico) through most of the happenings is Emily Rose Lezin as his unexpected ‘Inamorata’, “Amalia Balash”. Gifted with a glorious Mezzo-Soprano, she puts her pristine talent into the service of the many numbers that she’s been ascribed. Her initial descant called “No More Candy”—an ode to (of all things,) a musical ‘Candy Box”, is A-Plus; while quickly thereafter, amidst “I Don’t Know His Name”, she acquaints us with “Amalia’s” secret-but-not-so- hidden dreamy and romantic nature describing her “Dear Friend” in ways that are painfully evident she’s built him up into some kind of paragon of intellect and virtue, the likes of which no man can realistic match. This promptly swells into a delightful duet once ‘Ilona” joins in by crooning a snappy ‘counter-obbligato’, urging her to exercise caution when it comes to any man one has never even laid eyes on before. In response to this is Lezin’s sensitive handling of “Will He Like Me”, which not only reveals “Amalia’s” own hidden insecurities behind the outward bravado, but it also validates (all over again) how adept she is at communicating solid emotion through and beyond all her pretty-sounding notes. After intermission, she conjures vocal magic still again—this time with a healthy side of comedy, with her dazzling rendition of “Vanilla Ice Cream” (particularly with respect to the song’s final culmination!) Count this one as a bona fide show-stopper at which point we now come to learn—in no uncertain terms— that her lofty perceptions of “Dear Friend” are becoming a bit more ‘grounded’, thus allowing her to see “Georg” in a much more charitable light. Meanwhile, as the feisty man whose name is above the shop door, Michael Heimos furnishes exceptional and outstanding support a “Mr. Zoltan Maraczek”. While perhaps he doesn’t get as many chances to show off his laudable vocal ability, when he does—as in his breezy remembrances of “Maraczek’s” bygone days as a bold young bachelor (until he gave it all up once he met the future Mrs. Maraczek,) sung to lilting, “Blue Danube-esque” rhythm, it ranks a true unmitigated Act One Highlight. What’s more, the number gives added poignance and resonance later when he learns of her infidelity (with near tragic circumstances.) Upon this unsettling development though, Mr. Heimos firmly keeps us in his corner, presenting some compellingly palpable pathos once it’s also learned that his ‘beloved wife’ has been fooling around with one of his employees (—and worse: it’s not at all the one he was suspecting!) Kristen Daniels similarly does a superlative job as “Ilona Ritter”, with her approach being that of a lovely, vivacious (albeit a bit naïve) working-class lass (think someone along the lines of a platinum blonde “Betty Boop”.) Daniels patently knows how to find the overall humor in the role, and then implements it in all the best and broadest terms! She markedly prevails with her melodic ‘soliloquy”—addressed directly to the audience–titled “I Resolve” (once she finally comprehends that she’s simply been nothing more than just another notch on “Mr. Kodaly’s” bedpost–and that’s all she’ll ever be to him!) Subsequently in Act Two, she likewise makes the most of her successive ‘soliloquy” (introduced to a smooth ‘Bolero’ like beat,) entitled: “A Trip To The Library”. Sung to “Mr. Sipos”, through it we discover how a serendipitous change of scenery has brought her a highly-respectable (slightly bespectacled) caliber of gentleman into her life. By the same token, Terry Delegeane also contributes his share of laughs as their mild-mannered “Ladislav Sipos”. “I’m an Idiot” he tells Georg bluntly; “But at least I’m an idiot with a JOB!” His primary turn before the musical footlights referred to only as “Perspective” is uniquely and ingeniously staged with him virtually ‘conducting’ an imaginary orchestra as the shop fades out and he ascends an imaginary podium—all the better to proclaim his philosophy of life (and how he manages to get through it!) With the stage having mostly darkened (save for his place in the spotlight,) as the music swells to a near-furious crescendo, the ensemble behind him scramble out of the shadows to ‘re-assemble’ the set in time for the songs’ concluding coda; in this way, a merely ‘passable’ number becomes a clear-cut crowd-pleaser (–as it most assuredly did here!) Jordan Segal is also worthy of all the copious applause he’s bestowed as the narcissistic “Steven Kodaly”–the show’s principle antagonist (it doesn’t really have a proper “Villain”.) Although Segal’s way of expressing a song could be construed as more along the lines of a Top 40/“Boy Band” sound than that of a dyed-in-the-wool Broadway Belter, it is fairly potent nonetheless. His interpretation of the more-rascally-than-ribald seduction-through-song, “Ilona” is that of a petulant school boy as opposed to any kind of sexual predator, that has him ‘oozing’ plenty of transparent allure aimed at his gullible co-worker, and the ‘Salsa’-inspired exchanges they’re given reminds one of a self-absorbed Matador with “Ilona” being the hapless (read: soon to be heartbroken) ‘Bull’. Not to be overlooked either are the stunning technical and design aspects that the show plays out against. Chief among them is the scintillating set design by Tristen Griffin favoring angular lines and vibrant colors, contrasted against a more stolid stone-masonry façade; better yet, the main “Shop” set can conveniently ‘fold’, making the transitions from “indoor” scenes to those supposedly outdoors, quick and simple, while splashed across the back scrim proudly lording over all the proceedings is an etching of Budapest’s incipient Pre-World War Two landmark, “The Erzsabet Bridge” (as it appeared before its annihilation by the Axis powers at the close of Hungary’s occupation.) The costumes, by MarLee Candell are themselves colorful in their own right and unfailingly era-appropriate, each handily capturing the feel of a not always so ‘modern’ Central-European country circa the 1930’s. Moreover, granting that all the music here is pre-recorded, special props go out to Assistant Musical Director and Sound Mixer, Carson Schutze who is charged with standing by at the ready to ensure that each instrumental ‘accompaniment’ starts and ends on-time and in tune with the live performances on stage. Absolutely no small task, Mr. Schutze brilliantly never misses a down-beat or a sound cue! 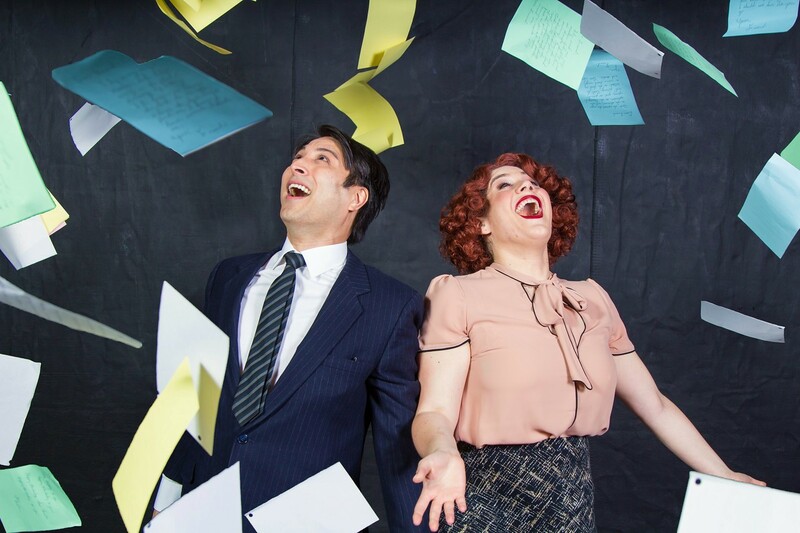 “It’s Incandescent!” (–and like some adolescent,) You’ll want to scrawl on every wall you see: You’ll LOVE “She Loves Me”! 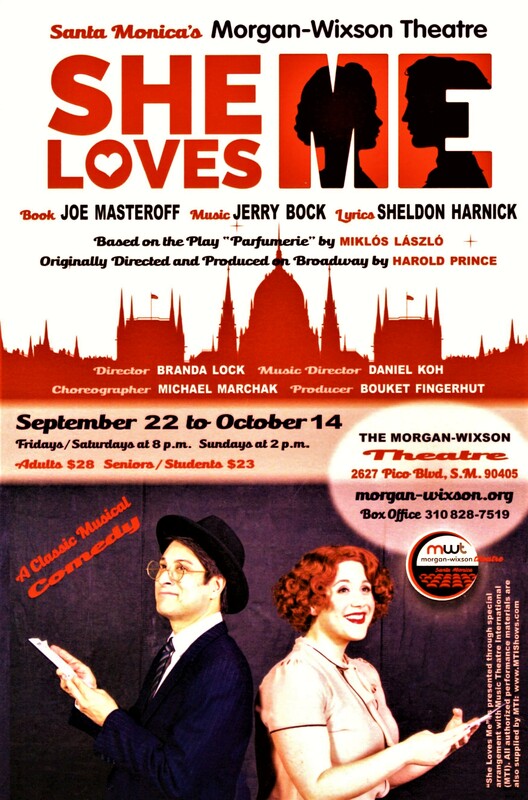 Having officially opened on Saturday, September 22nd, “She Loves Me” is slated to play through Sunday, October 14th, 2018 at “The Morgan-Wixson Theatre”, located at 2627 Pico Boulevard, Santa Monica CA. Showtimes are Fridays and Saturdays at 8:00 PM with Sunday Matinees at 2:00 PM. (A special ‘talk-back’ session with the cast and crew will be held after the final performance on Sunday, October 14th.) Tickets may be obtained either on-line by logging onto: http://www.morgan-wixson.org , by phone at (310) 828-7519 or via email at: mwtboxoffice@gmail.com. Student and Senior discounts are also being offered for this engagement, while plenty of free parking is available several doors down from the theater at the “Venice Family Clinic”, located at 2509 Pico Blvd, in Santa Monica. 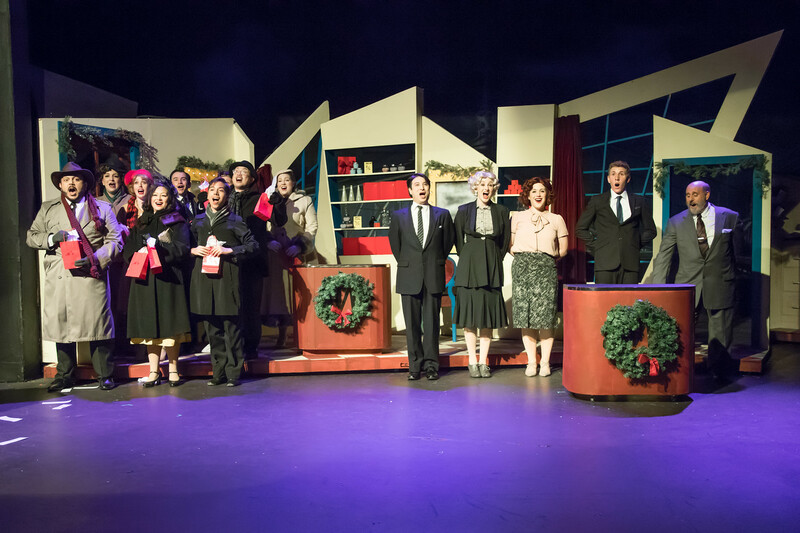 Production Photos By JDC Photography and Brian Norris, Courtesy Of Miriam Billington And “The Morgan-Wixson Theatre”. 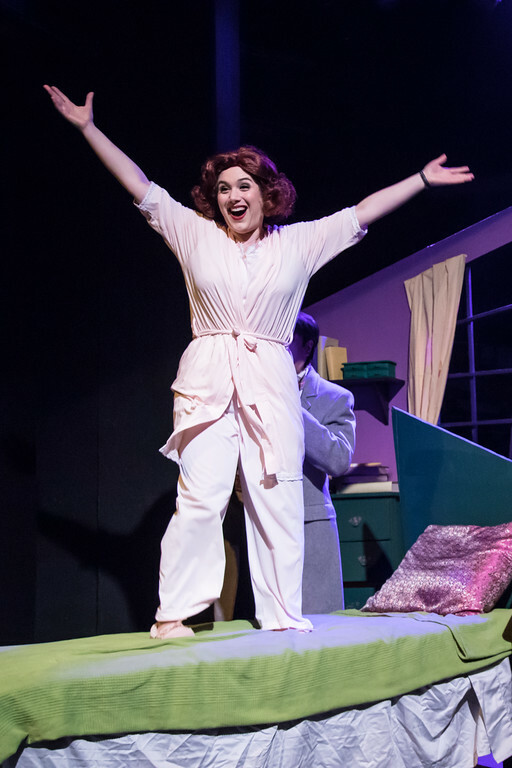 Special Thanks To Miriam Billington, Branda Lock, Michael Marchak, Daniel Koh, And To The Cast & Crew Of “The Morgan-Wixson Theatre’s” 2018 Production Of “She Loves Me” For Making This Story Possible. This entry was posted in Theater reviews and tagged "12 Days To Christmas", "A Romantic Atmosphere", "Days Gone By", "Dear Friend", "I Don't Know His Name", "In The Good Old Summertime", "No More Candy", "Parfumerie", "She Loves Me", "Shop Around The Corner", "Three Letters", "Tonight At Eight", "Try Me", "Vanilla Ice Cream", "You've Got Mail", 1963 Tony Award Best Musical Nominees, 1993 Outstanding Revival Winners, 1994 Olivier Award Winners, 2018 Los Angeles Theater Season, 2018 Southern California Theater Season, Amalia Balash, Arpad Lazlo, Barbara Baxley, Barbara Cook, Branda Lock, Budapest Hungary, Daniel Koh, Daniel Massey, Geog Novack, Golden Age Musicals, Ilona Ritter, Jack Cassidy, Jerry Bock, Joe Masteroff, Ladislav Sipos, Maraczek's And Company, Michael Marchak, Miklos Laszlo, Mr. Maraczek, Musical Candy Box, Outstanding Musical Winners, Pre-War II Musicals, Santa Monica CA, Santa Monica California, Santa Monica Theaters, Sheldon Harnick, Steven Kodaly, The Cafe Imperiale, The Morgan-Wixson Theatre, Tony Award Nominees, Will Wonders Never Cease?. Bookmark the permalink.